Rachel Dolezal was raised by strict fundamentalists: The revelation sheds light on her story. Rachel Dolezal Was Raised by Christian Fundamentalists. No Wonder She Wanted a New Identity. 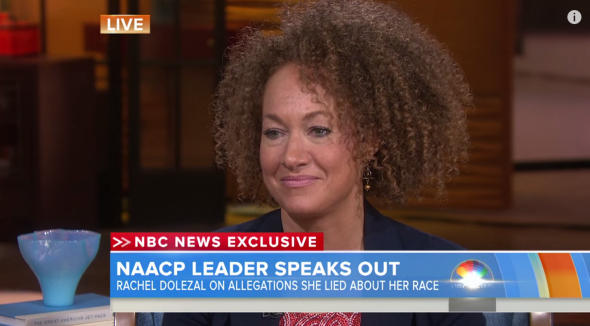 Rachel Dolezal on the Today show on June 16, 2015. The bizarre story of Rachel Dolezal, the white NAACP official who has been passing herself off as black for years, has been the flashpoint for tons of heated debate and think pieces as well as the inspiration behind some interesting history lessons. But so far there’s been relatively little information that could help answer one central question: Why? This aligns with some of what we already know about Dolezal’s family: Her adopted brother, Izaiah Dolezal, sued for emancipation at age 16; he claimed that “my adoptive parents use physical forms of punishment as well as sending children away to other states to group homes (where two of my siblings are) if we don’t cooperate with their religion and rules, they make us do manual labor and send us away.” Instead of granting his request for emancipation, the court settled on transferring his guardianship to his now infamous older sister, Rachel. If Rachel Dolezal did indeed grow up in an abusive, extremist family, it’s of course no excuse for lying about her identity. But the cult-like fundamentalism that festers in so many pockets of our country does real damage to the psyches of people who might grow up to rebel against their upbringing—and even reject their core identity—in the strangest of ways.